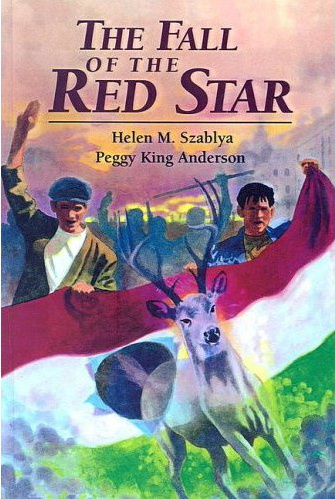 "The Fall of the Red Star" / "A Voros Csillag Lehull"
Helen Szablya's book, "The Fall of the Red Star" is a story of the 1956 Hungarian Revolution through the eyes of an "illegal" boy scout troop. Published by the book publishing arm of Highlights Magazine. Internationally acclaimed, it won first prizes from the Washington Press Association and the National Federation of Press Women. It was published for the 40th anniversary of the Revolution. Fourteen-year-old Stephen, an aspiring musician, becomes a freedom fighter in the Hungarian rebellion against the Soviets in 1956. He and his friends learn to make Molotov cocktails, kill (despite agonizing remorse), and make coffins and bury the dead. Stephen's personal life is also in an uproar: he helps deliver his sister Maria's baby, and his father returns after being in prison for years. There's a thrilling escape, based on the experiences of Szablya's family, with Stephen's family fleeing by truck, by boat, and on foot through a swamp. The authors do a good job of conveying the horrors of modern-day urban warfare, which turns familiar surroundings into a battle zone, and readers learn some recent history as well as gain poignant insight into the making of everyday heroes. The Honorable Helen M. (Ilona) Szablya is the Honorary Consul of the Republic of Hungary for the States of Washington, Oregon, and Idaho based in Seattle. Born and raised in Budapest, Hungary, she is an award-winning author, columnist, translator, lecturer, and former publisher of Hungary International, a newsletter for Americans about business in Hungary. She has two university degrees, speaks six languages, and lived in five countries under seven different political systems. The number of her English language publications exceeds 700, many of which won awards. Szablya Consultants, Inc. is her translation and consulting agency. Helen was President of the Washington Press Association and received its highest award, that of the "Communicator of Achievement". The National Federation of Press Women awarded her with a National First Prize for Editorials and the First Affiliate Presidents Award in 1988. Helen was project director and co-author of Hungary Remembered, an oral history drama/lecture series; a project commemorating the 30th anniversary of the Hungarian Revolution of 1956 (major grant from Washington Commission for the Humanities and National Endowment for the Humanities). It was featured on world wide wire services in 42 languages. It won two international awards and the George Washington Honor Medal from the Freedoms Foundation. Helen was an "Inquiring Mind" lecturer for the Washington Commission for the Humanities. Helen recently received the Order of Merit from the President of the Republic of Hungary for her life’s work. Born in Budapest, Hungary, Helen (Ilona) Szablya escaped to Canada and later settled in the state of Washington. She earned a bachelor of arts degree in foreign languages and literature from Washington State University. Fluent in six languages, she worked as a translator and interpreter for many years. Her dream of becoming a writer was postponed until 1965, when the last member of her immediate family escaped Hungary. Helen and her husband John, who was Professor Emeritus of Washington State University, have lived in Kirkland WA until his death in 2005, where Helen still resides. The couple has presented many hundreds of lectures on Hungary. They coauthored papers in the areas of energy affecting human culture and on translating/interpreting. The Szablya’s have seven children and 16 grandchildren. The family was named HUNGARIAN FAMILY OF THE YEAR by the Hungarian Congress in Cleveland, in 1981.